Situated in Ungasan Bali, the villas are only a short drive to Balangan beach, the Garuda Wisnu Kencana cultural park and within walking distance to the Nirmala waterpark for children or adults alike. You will adore the clean lines and see through windows that overlook the private swimming pool. All rooms are air-conditioned and have the modern conveniences of a home away from home. 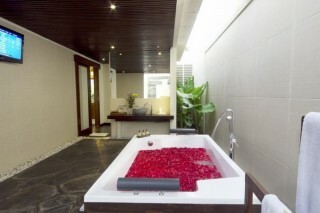 All rooms are air-conditioned and have their own en-suite bathroom. The one bedroom villas are in a separate pavilion to the one and have a glass surround allowing the pool and outside gardens to be a focal point. The one bedroom, on the other hand, has a door that opens up directly into the pool allowing the outside in. 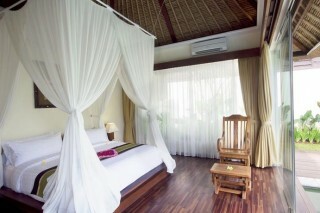 The rooms are well proportioned and comfortable, with king sized white canopy beds to luxuriate in. Each room has its own TV and wooden floors and a beautiful natural grained wooden bedhead adds to the touch of luxury that is so prevalent in these villas. Within the bathroom area is a large wardrobe suitable to hang or fold any clothing you have brought or will buy. 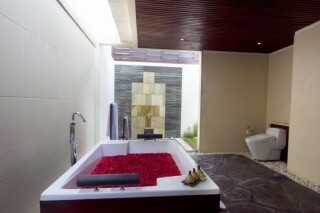 The bathroom is large with an open shower and a spa bathtub and one can enjoy the garden setting with its pebble stones and tropical foliage within this area. 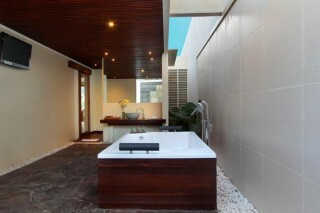 To ensure you don't miss your movie or game, a TV in the corner above the bath adds to the ambience in this villa. Each villa has its own private pool. 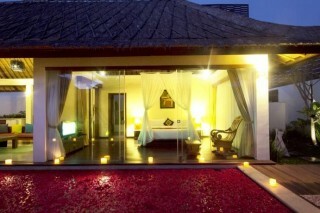 Situated ion the middle of the villa, the view can be enjoyed from one's bedroom or from the living area. A wooden sundeck surrounds the pool on two sides and sun lounges to sunbath are located close by.